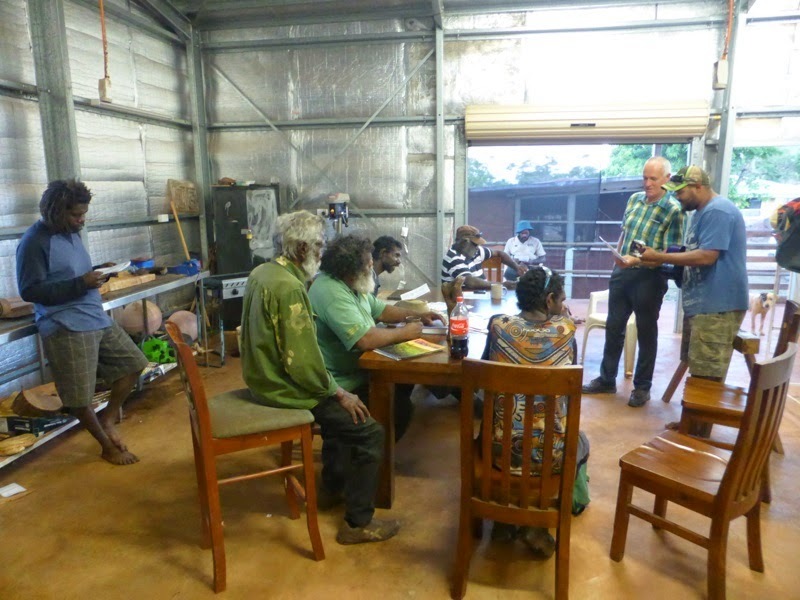 It is thirty-five years since the anthropologist John Haviland spent time with his family on the red dirt (durrbil) of Hope Vale, staying with their friends the Jackos, working with Tulo Gordon to write down the old stories and archive some of the old people's knowledges. Now we too have had the priviledge to stay with a generous local family and meet the next generation of elders and knowledge holders. 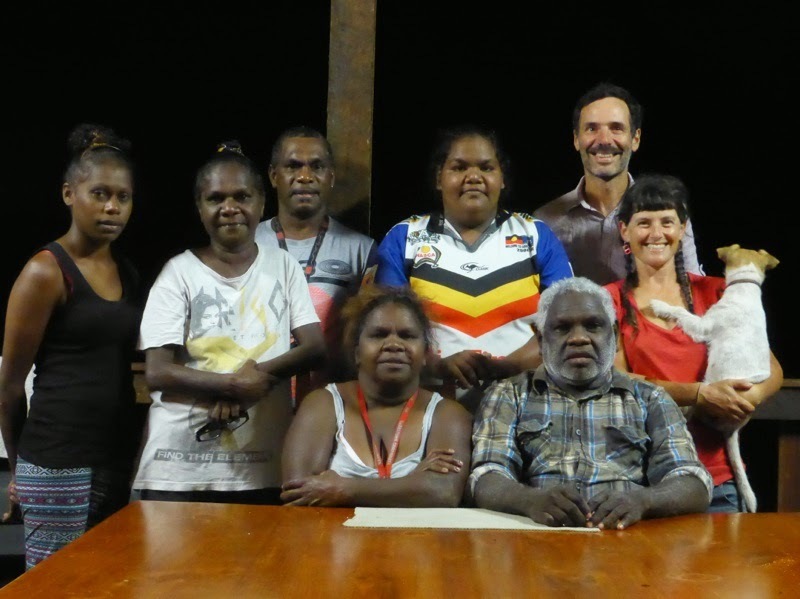 These past eight days spent with the Guugu Yimithirr people, guests of senior elder Tim McGreen and community elder Elaine McGreen, have been the pinnacle of our trip, not only because Hope Vale is our furthest point north, but because of what we learnt and what we shared with this remarkable community. 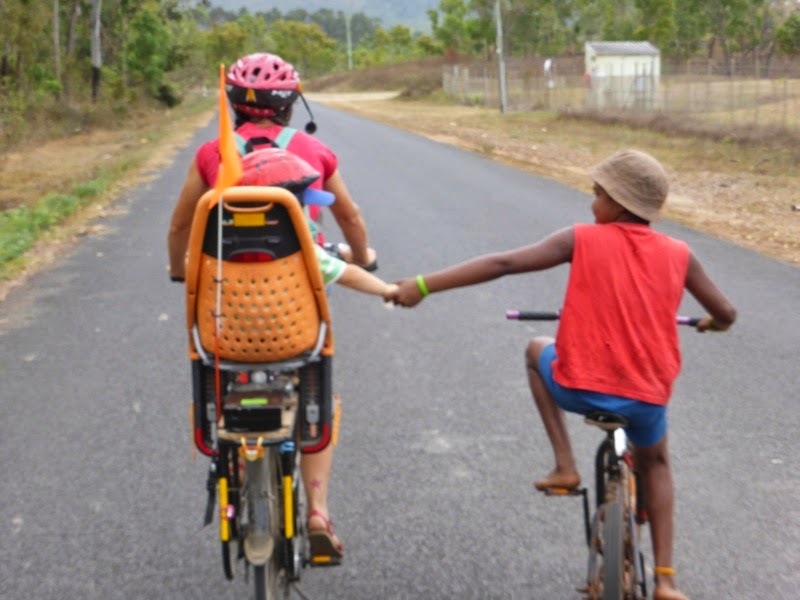 Wherever we cycled we were joined by a critical mass of Guugu Yimithirr kids, taking it in turns to ride on the tandem. 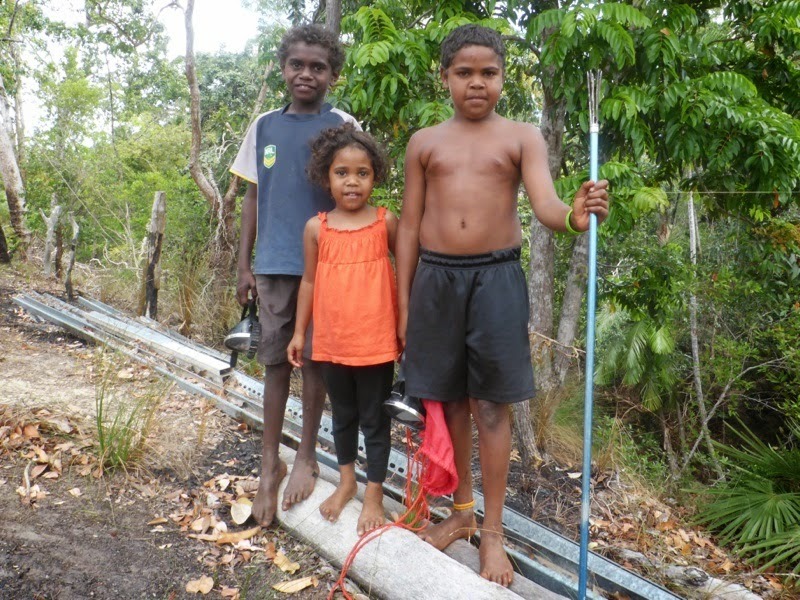 Tim and Elaine's grandson Zaymon and his friend Muundhu are knowledgeable spear fisherboys and they showed us how they dive (nguurmal-dudaa guuju-wi) in the river (birri) holes looking for crayfish (yilnggurr), jewfish (biguthirr) and bream (barrbal). Zaymon's sister Irie was never far from the action. 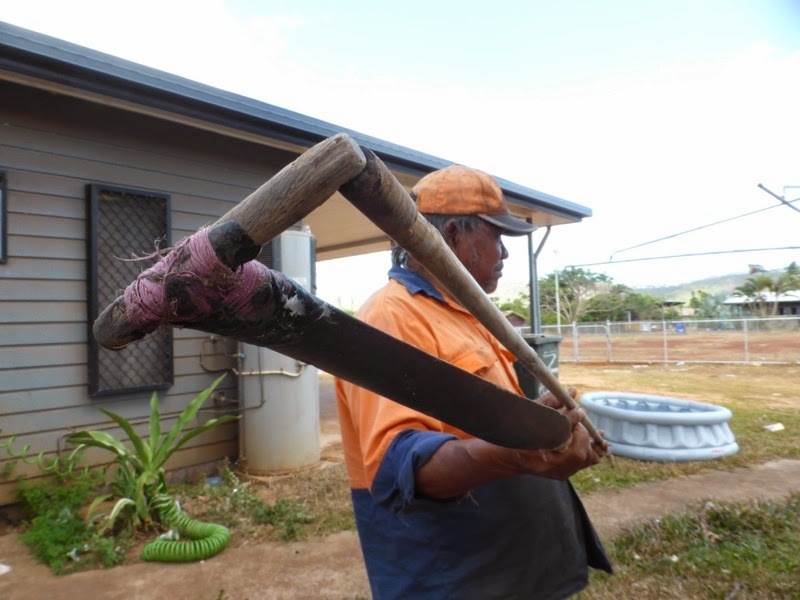 Tim spoke to us about the ecological importance of eels (biganh) in the upper catchments of rivers and said that Guugu Yimithirr people do not hunt biganh there as they 'keep the river flowing'. Only down stream should biganh be caught, he said. Tim also taught us about fire management. Small spot fires, burning-off grass (dulngga) and excessive fallen limbs, patiently carried out over many weeks and under the right conditions will reduce fuel load while regenerating and enhancing the bush, he told us. 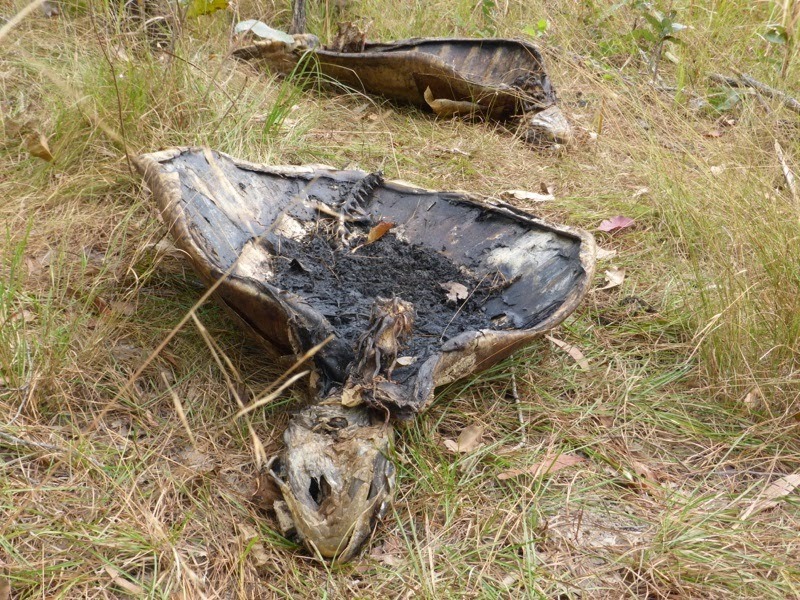 We saw evidence of this burning practice around Tim and Elaine's, 4 km east of Hope Vale. 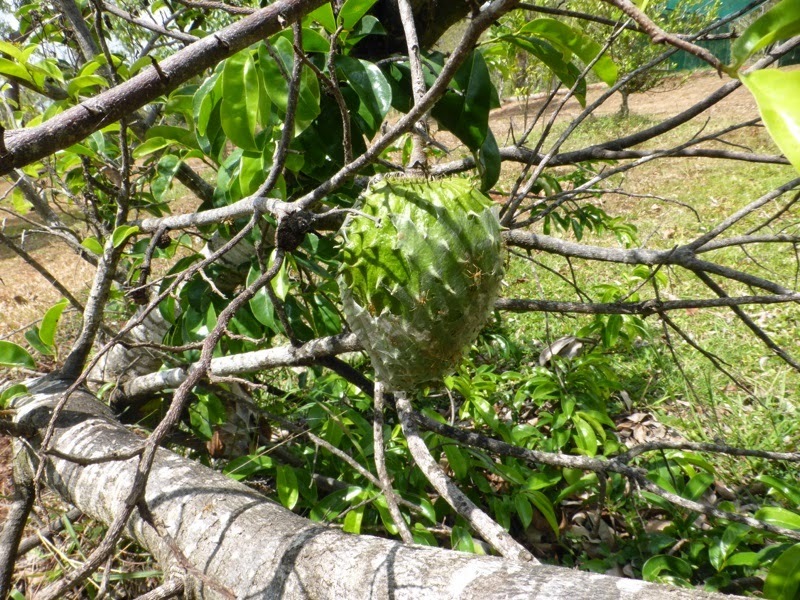 and witnessed the effects of Cyclone Ita in how they applied to this soursop (Annona muricata) tree. 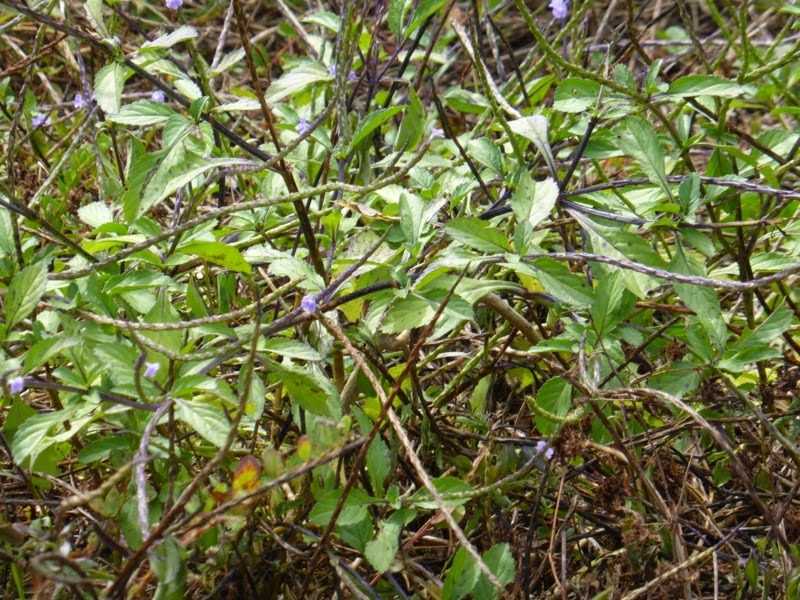 and the leaves of purple snakeweed (Stachytarpheta cayennensis), a common weed found around the town that we first encountered on Palm Island. and he spoke to us about three other medicines that were once commonly used. 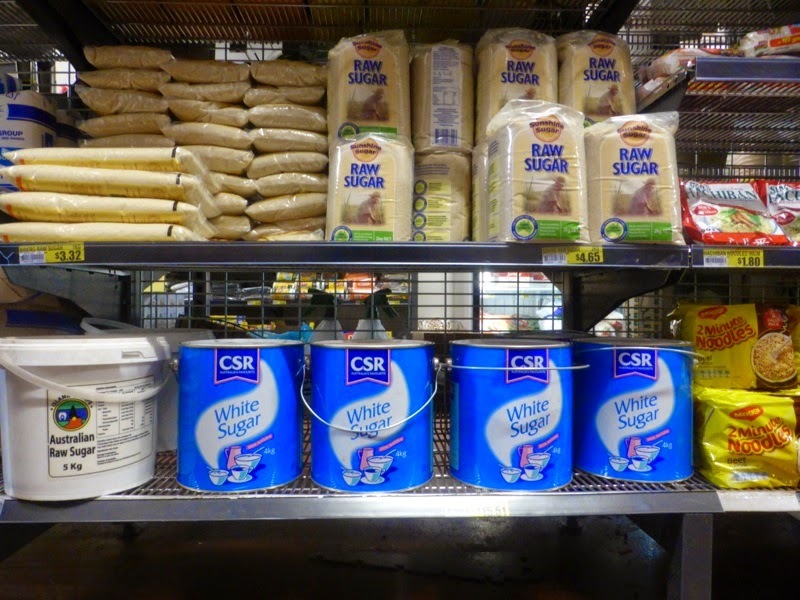 The first was dugong (girrbathi, munhaarri) oil, a traditional food-medicine which was also administered daily by the Lutheran pastor Schwartz (Muni) at the original mission at Hope Valley. 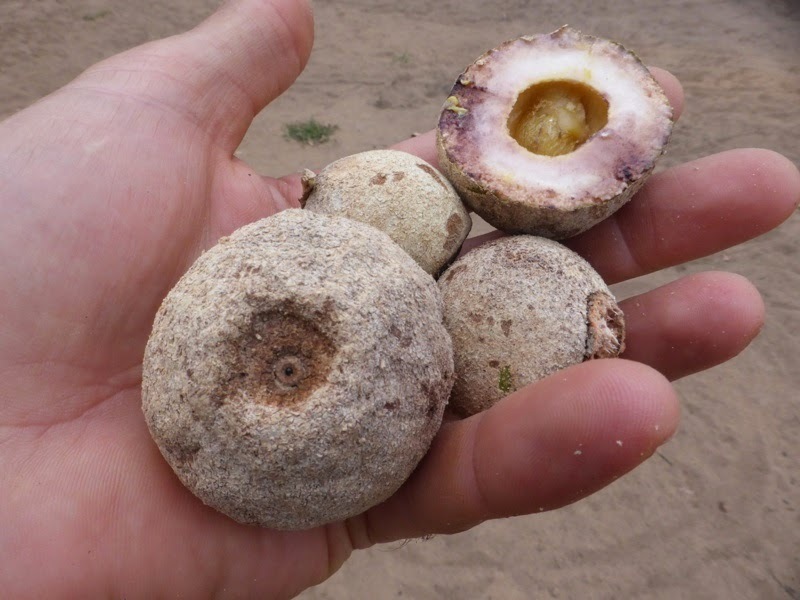 The second was green ant (thinggan) juice, full of citric acid and administered to treat colds and flus and also used as a natural antiseptic whereby a host of ants are rubbed into the hands of spear and woomera (babaar) makers when working with the poisonous ironwood (biniirr). The third was fruit bat (thulgu, thiibuul, jungginh, gaambi) soup, which was administered to children for a range of health issues; the Guugu Yimithirr version of chicken soup (when chickens were happy free-rangers, ate a diversity of seeds, grubs, grass grains and insects, and were not caged, pumped full of hormones and bathed in chemicals). 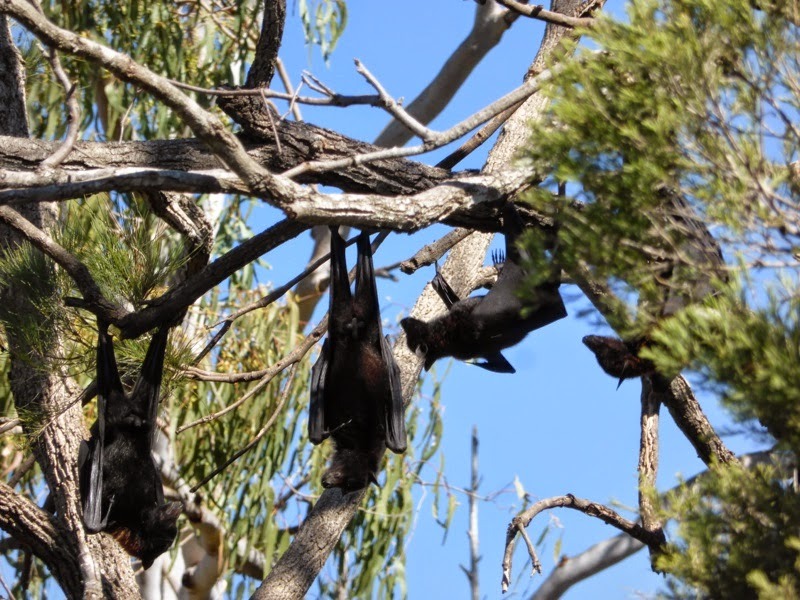 The Guugu Yimithirr know that fruitarians, such as fruit bats, make excellent food medicine. Pastor George lamented that much of the old peoples' knowledge was becomming lost, but we saw in the younger generations something quite different. 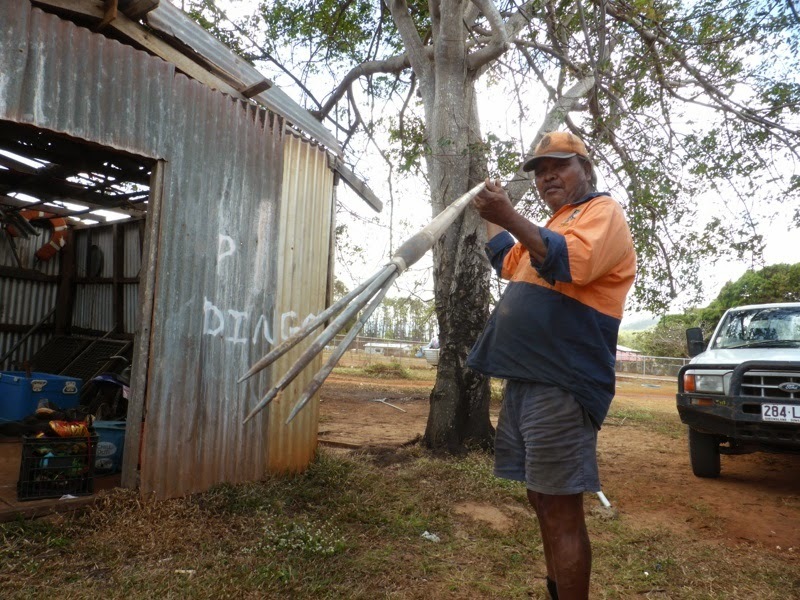 We met Neville Bowen, Clarry and Dora's brother who holds the knowledge of fishing spear (banyjarr) making and hunting. We were impressed to learn about the exacting science and art to making a Guugu Yimithirr spear, each one weighted to the spear thrower's arm reach. The babaar is made of the extremely hard timber ironwood and is also used as a fish scaler and a hatchett for opening coconuts. 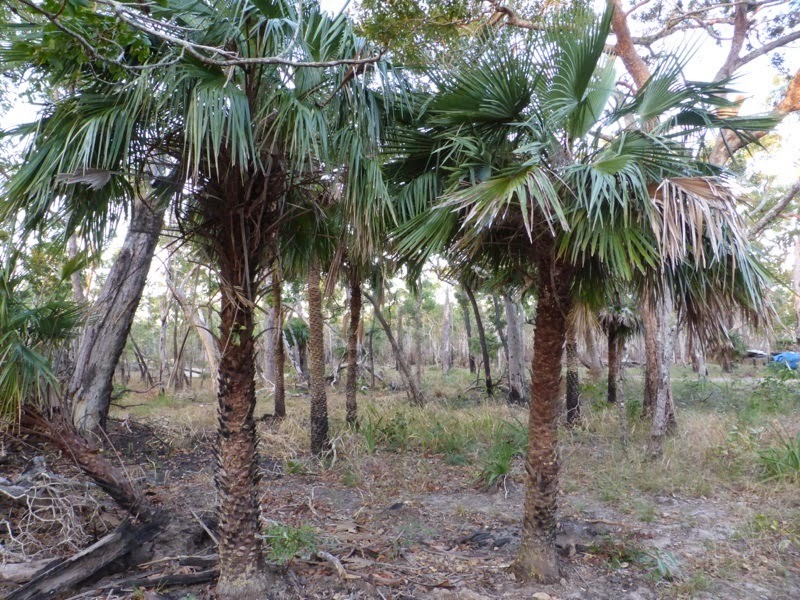 The tar from ironwwood root (ngurran) is used as a glue on both spear and babaar. Neville's medicine tree that he prepares in the same way as Clarry is the rubbertree or bally-gum (gundaar). 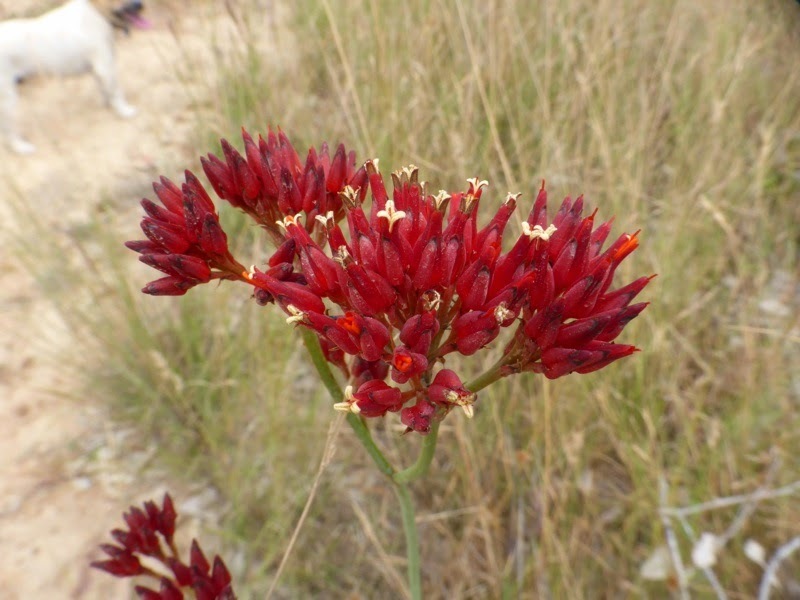 He uses this bark medicine for toothache, high blood pressure and broken bones. Each day we were more and more impressed with the knowledge holders in Hope Vale and the seed was planted for us to one day return to make a film archive of all the diverse knowledges people hold in the community and to honour the likes of Pastor George and the Guugu Yimithirr ancestors (muguulmuguuul) by demonstrating that ecological culture and knowledge remains strong, as we also witnessed at the Hope Vale Arts and Cultural Centre. 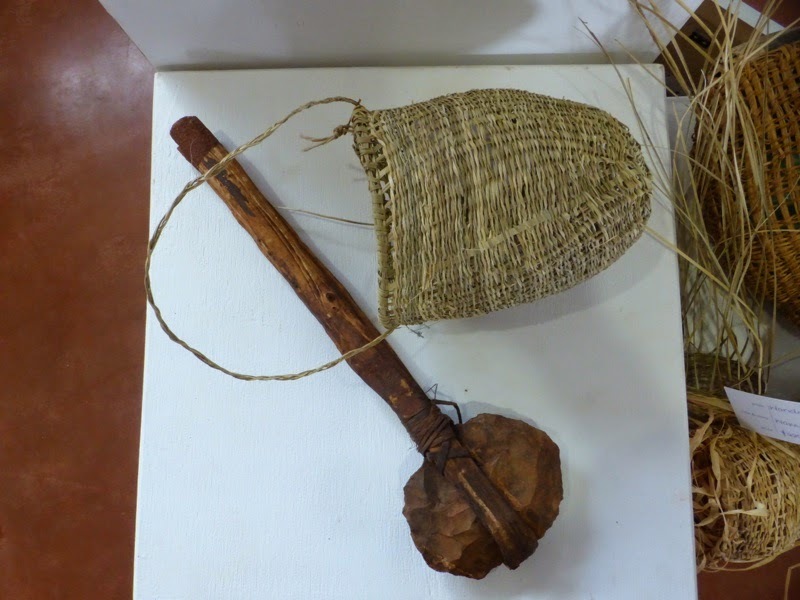 A traditional axe (warrbi) was one of many things exhibited. 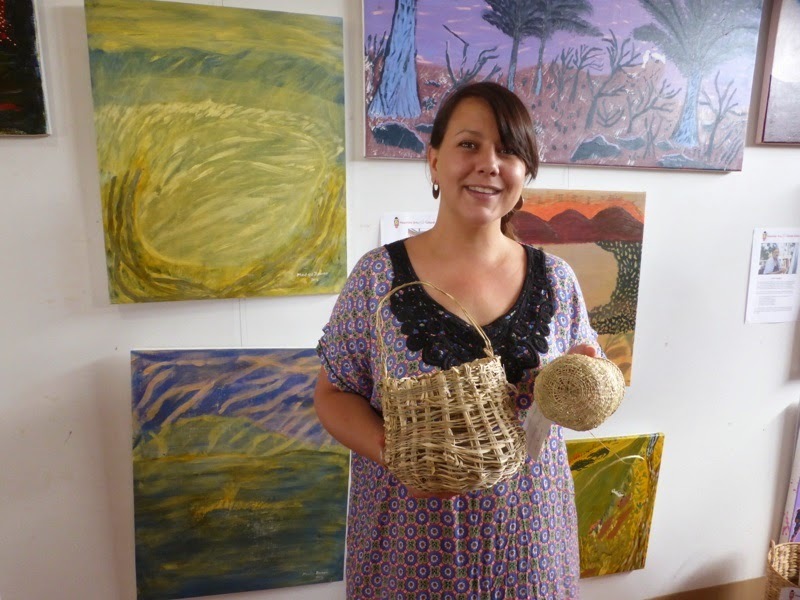 Dilly bags (ngunyin, bayji) and other woven bags for either collecting, straining or for leaching toxins out of plants are still made in the community. Tara Zaicz is the business mentor at the centre, and is also a passionate advocate of new cultural forms and expressions in the community. 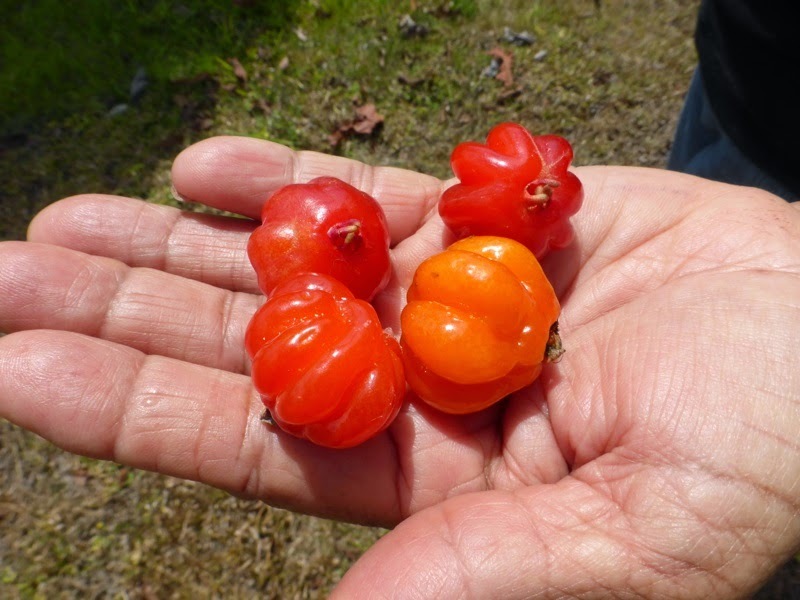 We went on many walks and discovered a number of plants that Guugu Yimithirr people use for both sustenance, medicine and culture, such as these bloodroot lilies (tandai, jijiran). The roots were dug up, peeled and boiled to produce a brilliant red dye used to colour grasses for basket and bag making. 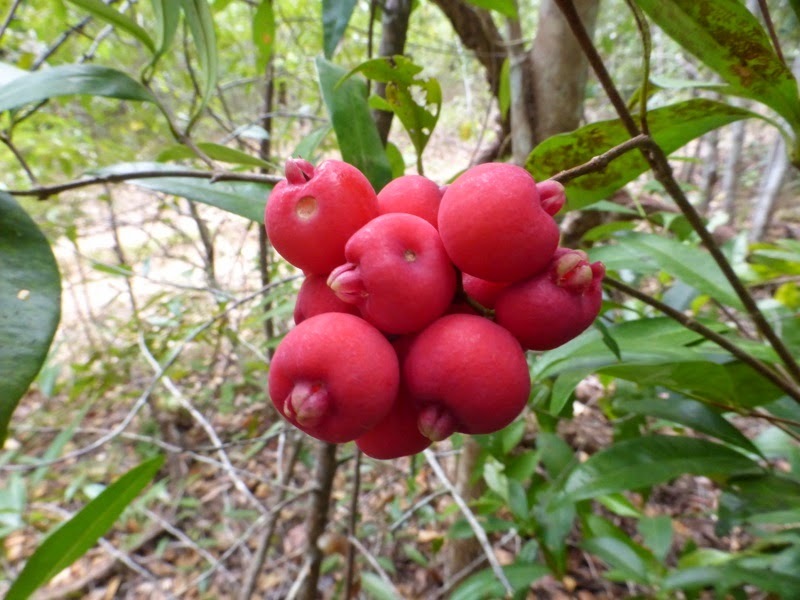 We also sampled Bloodwood (babatha) apples (Cystococcus sp.) for the first time. A delicious bush tucker that's out in the bush in abundance. 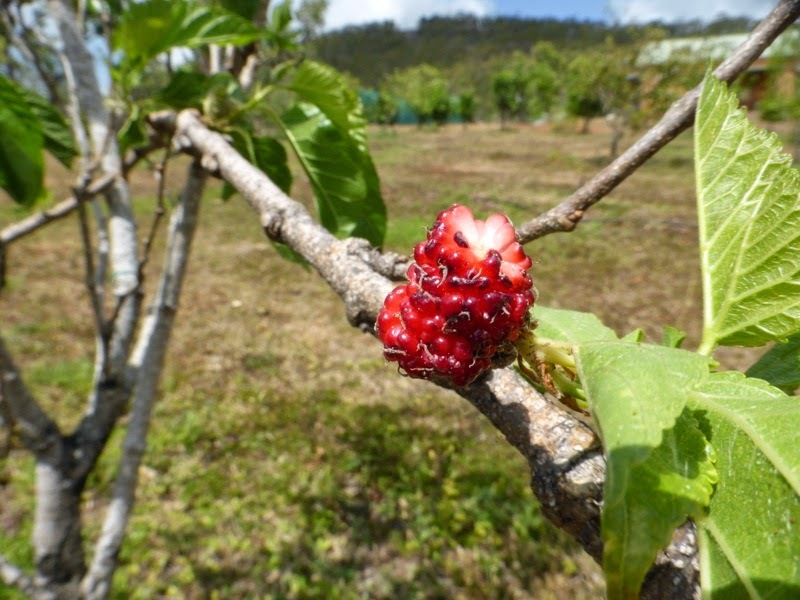 You take the top off the 'apple' of this little woody parasite to reveal the sweet jellied larvae (insect gall) that you can eat with the moist inner lining, which is a little like coconut flesh. Over the weekend Tim and his family went up to his father's country at Jack River (barranhtha), north of Hope Vale for a few days and we stayed back and looked after the farm and hung out with the family's dogs (gudaa, ngaatharr), including Jimbo the dingo (gudaa yinil, ngamu ngaatharr). 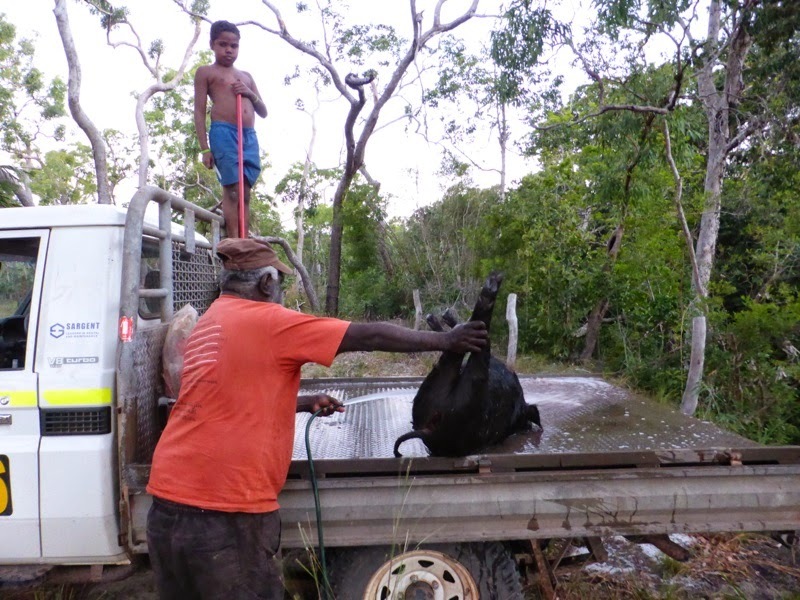 When they returned they brought back a wild boar (bigibigi), a newcomer species that has joined the long list of local bush tuckers Guugu Yimithirr people regularly eat. 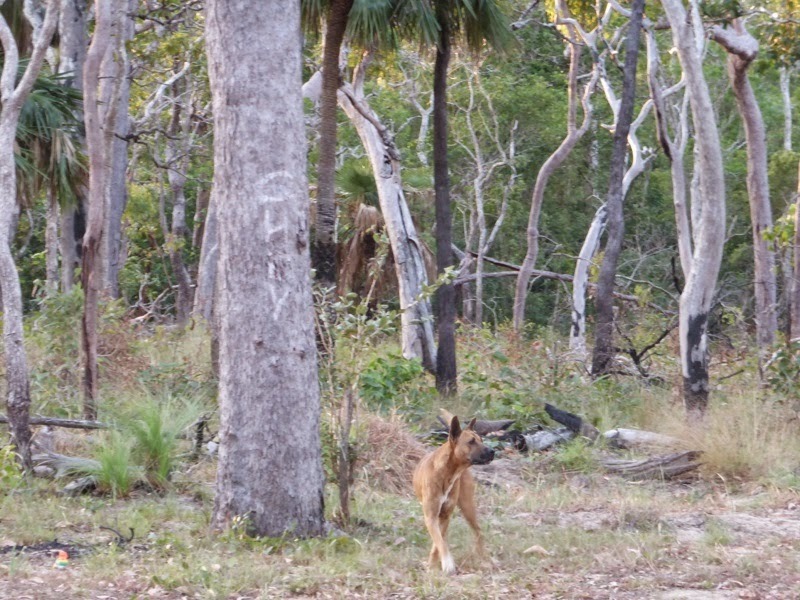 On our walks we also discovered evidence of more traditional foods consumed in the near coastal community; the dogs leading us to a site where we found sea turtle (guugu) shells (digirr). 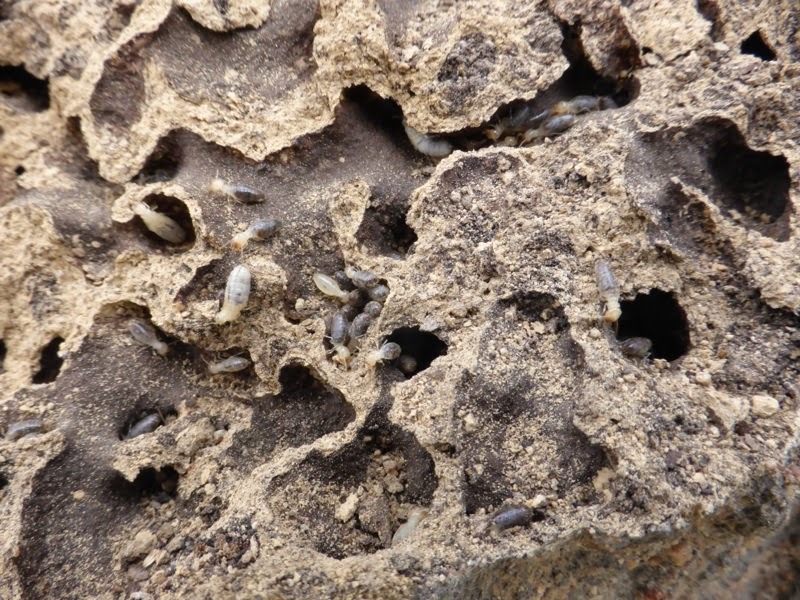 We also learnt that termite mounds and ant hills (bugul) were prised open, the eggs were eaten and the termite dirt was used as fish burley. 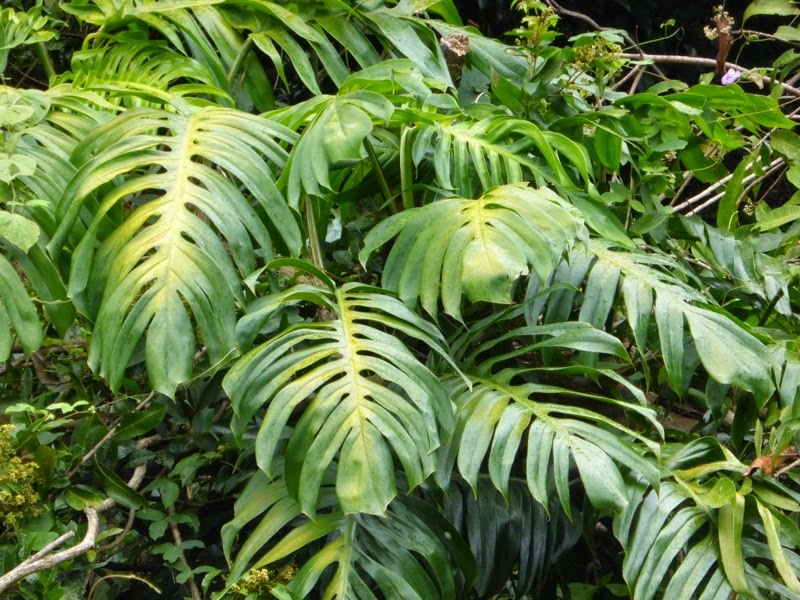 and the slow ripening Native Monstera (Rhaphidophora pinnata), have become strangers to young people, such is the legacy of economic and cultural assimilation. On our last night Patrick was invited to go along to the men's group. After being shown the various things made in the workshop and speaking with the men about bush foods, fire management and the NRL, Pastor David arrived and got us all singing a hymn. He then announced that the subject of discussion for the night was to be 'fear'. 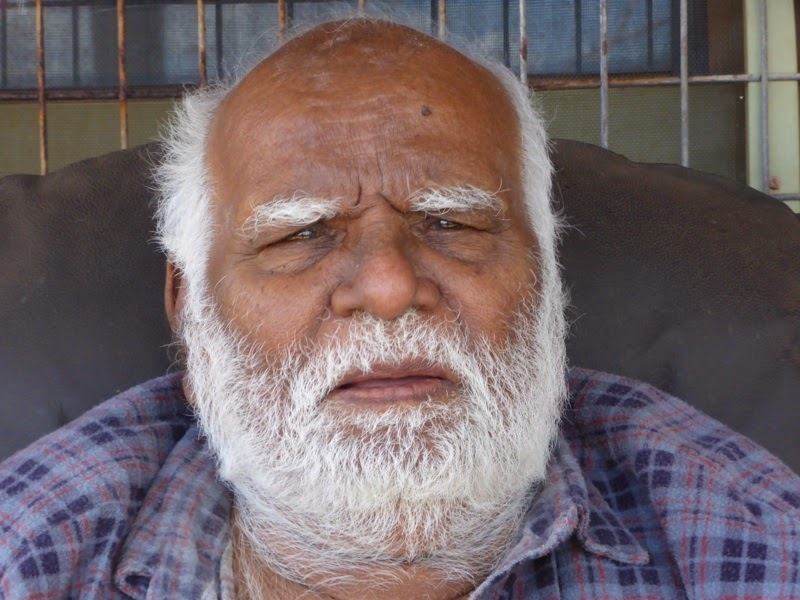 He proceeded to talk of the possibility of terrorist attacks in Australia and, remarkably, even Hope Vale, he planted the seed of the possibility of public beheadings, he spoke of trucks carrying fertiliser that could be used for making bombs and he spoke about placing our faith in Jesus to protect us from all of this evil. Fairly soon it became clear that fear wasn't the subject but rather the intention of the meeting. Patrick was not sure who this informal sermon was really for. While some folk want to continue to manipulate Aboriginal people, it is our intention to be wholly manipulated by Aboriginal lifeways, especially as they apply to land, more-than-human kin and non-monetary economics. As one bama said to us a while back, Adam and Eve could not have been blackfellas because Adam would have eaten the snake before the apple. 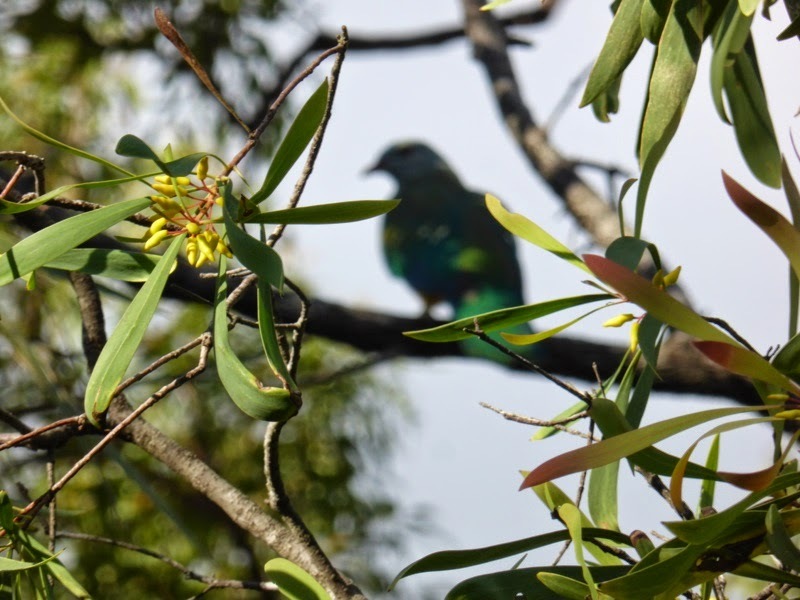 Our intention for visiting Hope Vale involves our attempt to rebuild our own ecological heritages within our household and freely share our findings. We wish to reinstate the principles of indigenous regenerative (ecological) economics and transition away from extractive (pollution) economics. 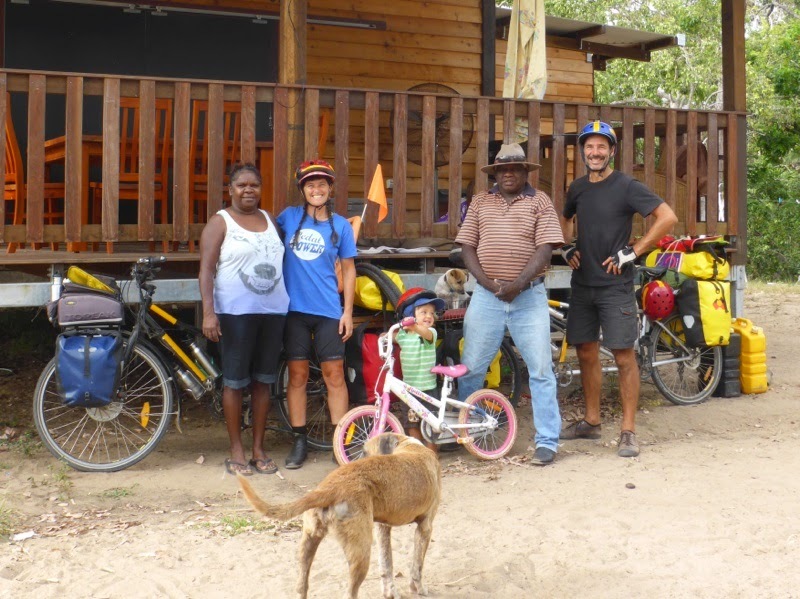 In the space of a relatively short time we were treated to a rich trove of knowledge in Hope Vale, and were lucky enough to be welcomed and trusted by many in the community. Woody was given a barrabarra bean (yulnga) shaker, one of the things some of the men make in the workshop. It delights him daily, then after the men's group, Tim and Elaine put on a farewell dinner for us with some friends and family. 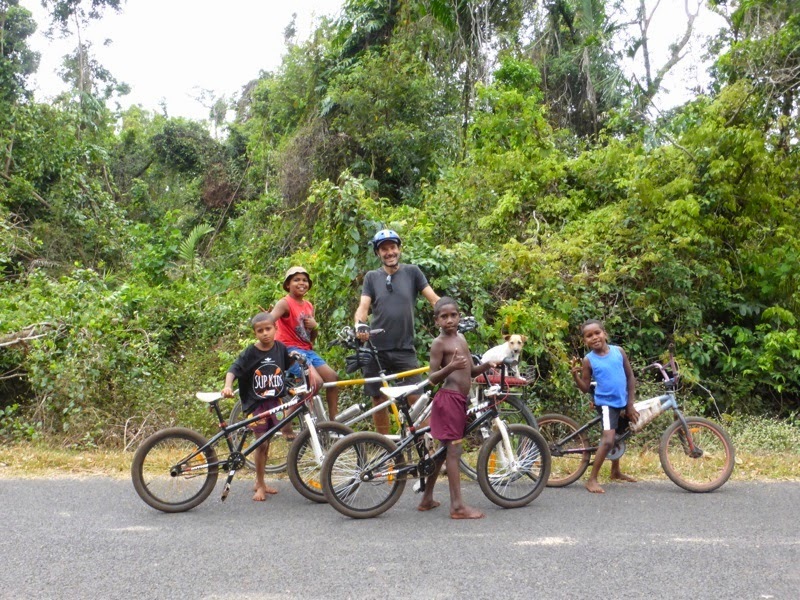 we hope our new friends will experience the delights of yam daisies and blue wrens in Jaara Jaara country. Leaving Tim and Elaine's home and the community of Hope Vale meant that we were finally turning south after ten and a half months of northerly transiting. Thanks Tim and Elaine, our week with you has been a highlight of our trip. 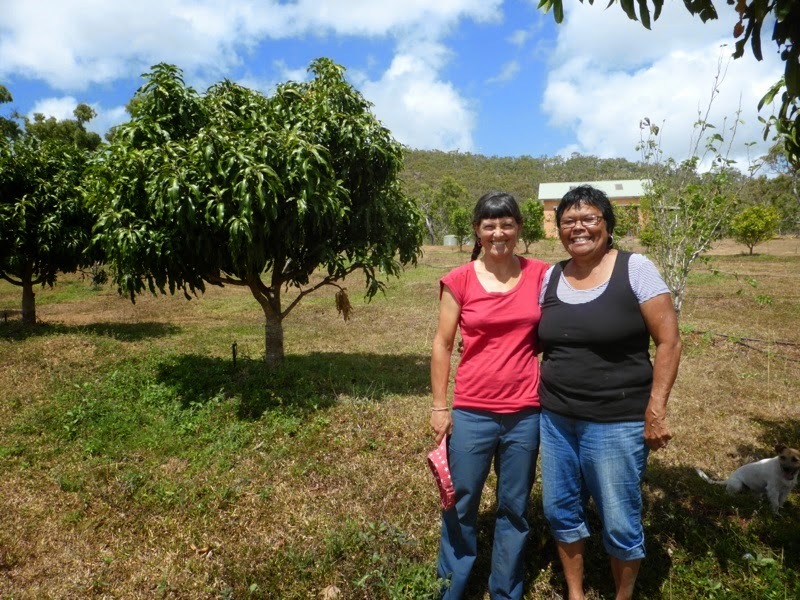 And many thanks Hope Vale for having us on your country, teaching us your language and sharing your knowledge. I read all your posts, Awesome stuff. Keep it up! thanks bt, so glad to have you along for the journey.